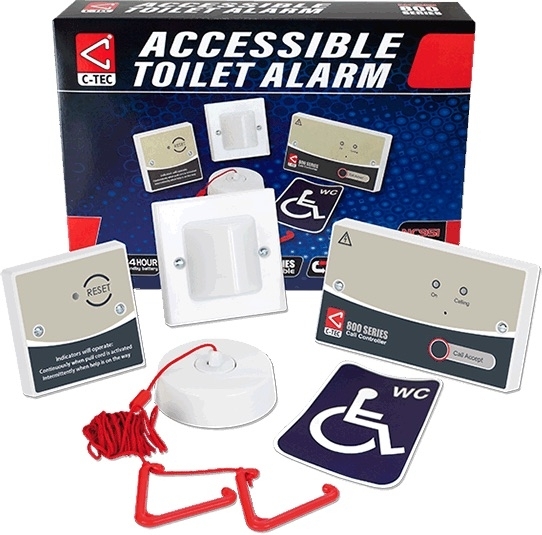 The UK's market-leading Disabled Persons Toilet Alarm kit. 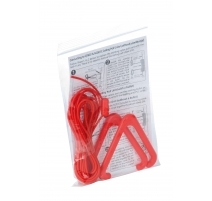 Includes everything required for a BS8300 clause compliant emergency assistance alarm. 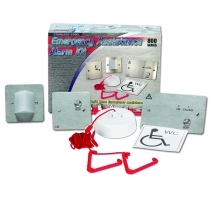 Allows a distressed person to raise an alarm in the event of an emergency. To operate, the user pulls the cord of a ceiling pull to activate a light and sounder outside the WC and on the system's Call Controller. New ‘Call Accept’ functionality allows staff to send an intermittent call acknowledgment signal inside the WC to confirm help is on the way. Includes an NC943B 12V 140mA Call Controller c/w standby battery and relay, NC807C Ceiling Pull, NC806CS Overdoor Light c/w Sounder, NC809DBBT Accessible Toilet Reset Point c/w Sounder and NC949 Accessible WC Sticker. Can also be used as a single zone emergency assistance alarm in changing rooms, solariums, interview rooms, reception areas and more. Mains supply 230V 50/60Hz (23mA max. current). 50Hz frequency. Internal power supply 12V d.c.
Total output current limited to 140mA. Quiescent current See individual device listings for NC943B, NC807C, NC806CS and NC809DBBT. Max battery size and type NC943B includes an onboard 500mA rechargeable standby battery that will power the system for up to 24 hours standby and 15 minutes alarm running time. Alarm current 40mA (all NC951 devices, this includes 18mA Zone current). Auxiliary relays NC943B has one set of volt free relay contacts (NO/C/NC). Relay activates when a call is received by the controller. Rated at 30V d.c. @ 1A. Controls NC943B has a link-selectable Call Accept/Reset button; NC807C has a pull cord with two bangles to generate a call; NC809DBBT has a Reset button. Expansion connections For applications requiring more than one point of call (e.g. at the WC and the wash basin), up to 3 ceiling pulls can be daisychained together. Onboard Sounder Yes (on NC809DBBT, NC806CS and NC943B). Product dimensions (mm) 147 W x 87 H x 93 D (NC943B); 87 W x 87 H x 68 D (NC806CS); 87 W x 87 H x 24 D (NC809DBBT). Ceiling pull measures 93mm diameter x 27 D.
Packaging dimensions (mm) 285 W x 201 H x 55 D mm (size of NC951 kit box containing all items). 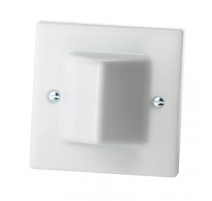 IP Rating IP41 (all wall mounting devices); IP21 (ceiling pull). Operating conditions/temperature -5ºC to +40ºC. Max. relative humidity 95% non-condensing. 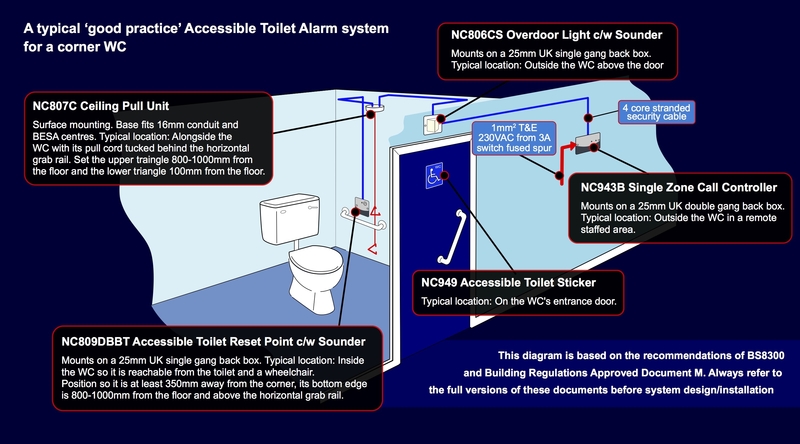 Notes The NC951 contains everything required for a stand-alone single zone accessible toilet alarm system. 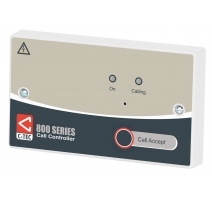 For multi-zone systems consider using one of our NC910 or NC920 range of 10-20 Zone Call Controllers. NC943B Call Controller: 147 W x 87 H x 39 D mm. Mounts on a 25mm UK double gang back box. NC807C Ceiling Pull: 93mm diameter x 27mm deep. Surface mountable on a ceiling. NC806CS Overdoor Light c/w Sounder: 87 W x 87 H x 68 D mm. Mounts on a 25mm UK single gang back box. 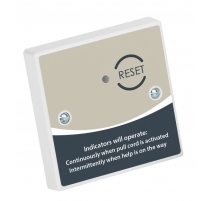 NC809DBBT Accessible Toilet Reset Point c/w Sounder 87 W x 87 H x 24 D mm. Mounts on a 25mm UK single gang back box. NC949 Accessible WC Sticker TBC. 1. 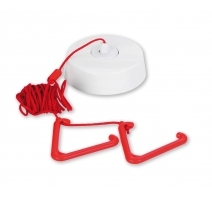 The distressed person raises an alarm by pulling the cord on the NC807C Ceiling Pull Unit. • The red reassurance LED on the NC807C Ceiling Pull Unit and the red reassurance LED and sounder on the NC809DBBT Reset Point c/w Sounder activate steady to reassure the user the call has been registered. • The red Alarm LEDs and sounder on the NC806CS Overdoor Light c/w Sounder and the red ‘CALLING’ LED and Sounder on the NC943B Call Controller activate steady to let staff know someone is in need of assistance. 2. The member of staff responding to the Alarm call presses the 'Call Accept' button on the Call Controller. • The red reassurance LED and sounder on the NC809DBBT Reset Point c/w Sounder activate intermittently (approx 1 second on, 5 seconds off) to let the user know help is on the way. • All indicators and sounders are extinguished and the system returns to normal. OPTIONS: A link inside the NC943B Call Controller allows its button operation to be configured so instead of accepting an Alarm call, it resets the call or has no effect. 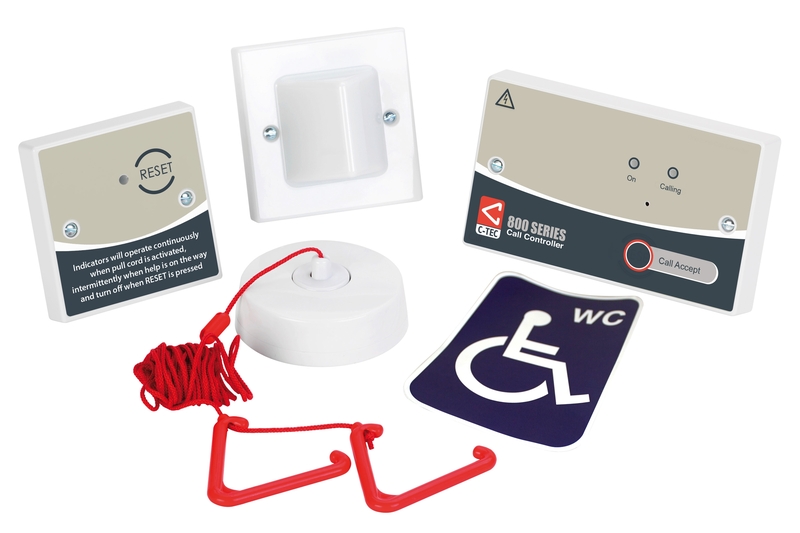 Both of these functions are outside the scope of BS8300 and are therefore not recommended for use in Accessible Toilet Alarm installations. However they may be suitable for use in other applications subject to the approval of the responsible person(s). See individual device listings for NC943B, NC807C, NC806CS and NC809DBBT.